NOTE: Canvas will be upgrading their native "Quizzes" tool in fall 2017 which will have some new features and question types. 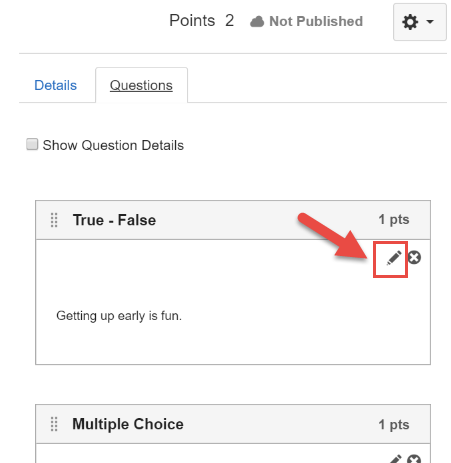 Although all answer options will copy over, the correct answers will not be indicated in Canvas. Some question types in Classes*v2 are not available in Canvas. 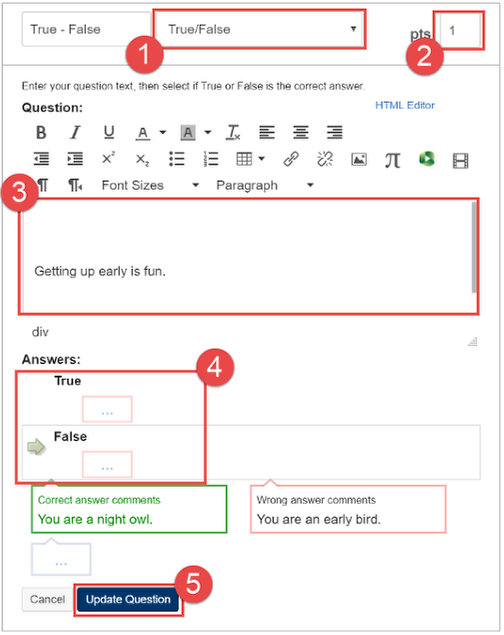 These questions will need to be rewritten to work with the question types available in Canvas. Images, Videos, and other media may not be copied over. When this happens, you will need to download these items from Classes*v2 and re-insert them in Canvas. 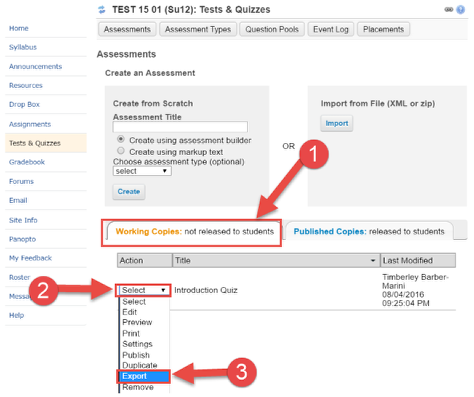 Some feedback for questions may not be copied over - you may need to copy and paste them from Classes*v2 into Canvas. Go to the "Working Copies" tab (1) and find your quiz. From the drop down menu next to your quiz (2), select "Export" (3). On the next screen, select the radio button for QTI v 1.2 (4) and then click the "Export" button (5). A pop-up window will appear. Click the "Download" button (6). The file will be downloaded to your computer. It will be in the form of a .XML file and will have a name of "exported-assessment.xml" (if you have downloaded multiple quiz files, a numeric suffix may be added to the filename). On your computer, use the Finder (Mac) or File Explorer (PC) to locate your file. 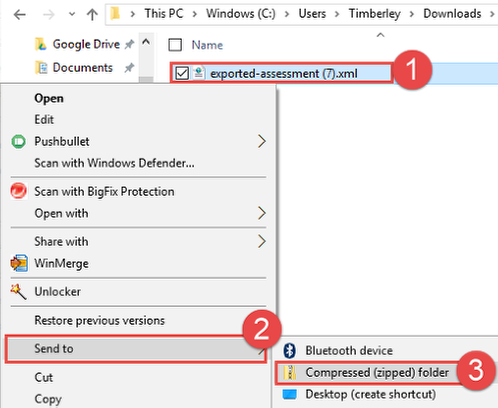 From the contextual menu that appears, select "Send to"
From the sub menu, select "Compressed (zippped) folder"
From the contextual menu, select "Compress filename"
On the right side of the settings screen, click the "Import Content into this Course" button. 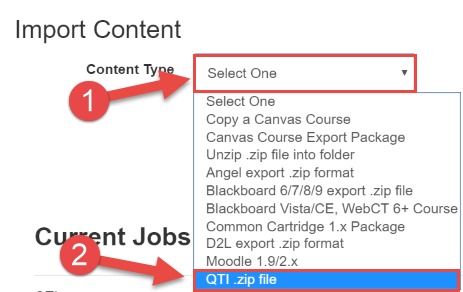 On the Import page, click on the "Content Type" drop down menu (1) and select "QTI .zip file" (2). Click the "Choose File" button (3) and navigate to the .ZIP file you just created. 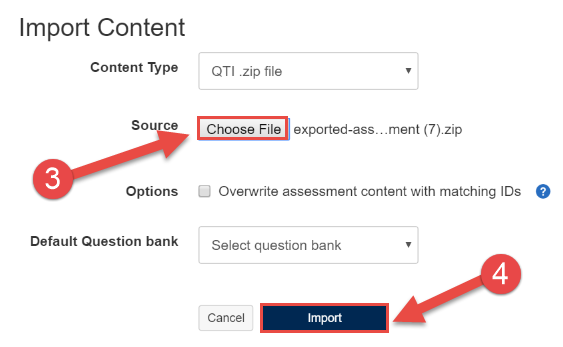 Once you have selected your file, click the "Import" button (4) to begin the import process. Once the process is started, you will be able to watch the progress of your import under the "Current Jobs" area. Once finished, you should see that the file is "Completed". NOTE: Because of the issues mentioned at the beginning of this article, you will like have a few issues noted. On the next screen, click the "Questions" tab. 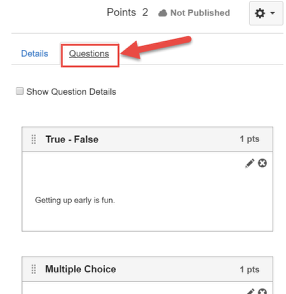 Click the Edit (pencil icon) button to begin editing your question. Verify that the question type is correct; change if necessary. Verify that the point value is correct; change if necessary. Check the question stimulus text. There may be extra white space before your question text begins. Delete any unnecessary spaces. The correct answer will NOT be selected. Click on an answer to set it as the correct answer. When you are finished, click the "Update Question" button. Continue to view and edit all questions until everything is set up correctly. When you have edited all of your questions, save your changes. 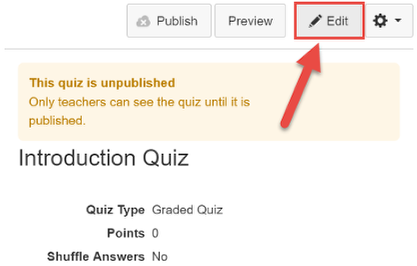 Click the "Save & Publish" button to save your changes and make the quiz available to your students.